The ‘New Normal’ never was, isn’t, and should be replaced by the ‘New Abnormal’. In the wake of the Global Crisis, the idea that the global economy had entered a low-growth equilibrium gained a curious acceptance. In reality, the situation is far from ‘normal’, and the attempt to characterise it as such has been deceptive, disingenuous, and dangerous. Instead, economists, policymakers, and investors would be better advised to think of the world economy as being in a period of profound disequilibrium, as the aftershocks of the Crisis collide with and complicate a range of structural changes. Ever since the onset of the Crisis in 2007-08, the global economy has been repeatedly flirting with a descent into an even more damaging deflationary depression. Policymakers have averted this only by a combination of luck, judgement, and experimentation. Belatedly, Mohamed El Erian – who, along with his former colleagues at PIMCO did much to promote the concept of the New Normal after they first floated it back in 2009 – has just abandoned it. He has argued that “it is no longer unusual to suggest that the West could linger in a low-level growth equilibrium […] Yet, […] growing internal tensions and contradictions, together with overreliance on monetary policy, are destabilising that equilibrium” (El Erian 2009). However, the suggestion that we have been living through a New Normal ‘equilibrium’ for the past seven years is hard to swallow. Normality suggests that the Crisis is behind us, and that we again understand what’s happening and that we can make predictions. It invites little sense of urgency to make radical policy adjustments. Indeed, it tempts us into thinking policy ‘normalisation’ may be around the corner. Indeed, it is hard to apply the dictionary definition of ‘normal’ to our recent experience – dictionaries typically define it as regular, usual, healthy, natural, orderly, ordinary, rational. There are several reasons why the term ‘abnormal’ might be more easily be applied. Rather than an ‘equilibrium’ we might more usefully think of the economic environment as having been one of latent or incipient instability. The first ingredient of the New Abnormal is the fact that the mediocre growth that has been achieved over the past few years has depended on unprecedented and progressively more aggressive monetary policy initiatives. 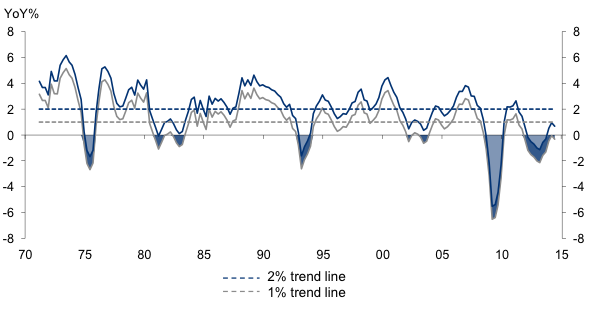 Meanwhile, fiscal policy, after the emergency easing of 2009-10, has been largely side-lined as a stabilisation tool. High levels of public debt have led most governments to calculate that they have little scope for fresh fiscal stimulus, notwithstanding the sustained fall in the yields on government bonds. The impetus for further monetary easing has typically been propelled by renewed panic attacks in the financial markets, which have rekindled the fears of a fresh chaotic downturn. The near-death experience of the Eurozone in 2011 following the emergence of the Greek debt crisis, the ‘taper tantrum’ in the emerging markets of 2013, and the China-inspired sell-offs of the past year all forced radical rethinking and easing of policy by the central banks. Zero interest rates, large scale asset purchasing (quantitative easing), and then a shift to negative interest rates, all have taken us into uncharted territory. This policy experimentation is hardly consistent with the New Normal notion that the global economy has been naturally gravitating towards a low-growth equilibrium. While the US Federal Reserve finally took the first step towards ‘normalising’ policy with an interest rate rise in December, the Bank of Japan and ECB have been busily ‘abnormalising’ with negative rates and more quantitative measures to pump money into their financial systems. The very fact that these monetary innovations are unprecedented means that their impact is unpredictable. This necessarily increases the scope for policy errors and conflicts. Indeed, the lack of consensus on what needs or can be done is palpable. One sign that all is not well is the recent emergence of a vitriolic debate about helicopter money, whereby central banks create money to distribute to citizens directly or via the government. Policy judgements are also clouded by the fact that pre-Crisis economic relationships have broken down. While the New Normal crowd try to declare the crisis a one-off interruption, it is clear that a range of structural changes are still in progress. We are faced with the rebalancing of China away from investment and export-led growth, sectoral shifts in the labour market, and a range of disruptive new technologies. On top of these, we are still contending with the unfinished business of tightening financial regulation and reshaping the financial system. Each of these structural shifts come with profound social and political consequences. In this context, how do we identify ‘trend’ economic growth? Where are we in the cycle? Talk of the New Normal shows how far the consensus still suffers from the ‘equilibrium delusion’. This is precisely the kind of thinking that led to the financial crisis in the first place. Two examples from the US illustrate the structural problems facing policymakers. 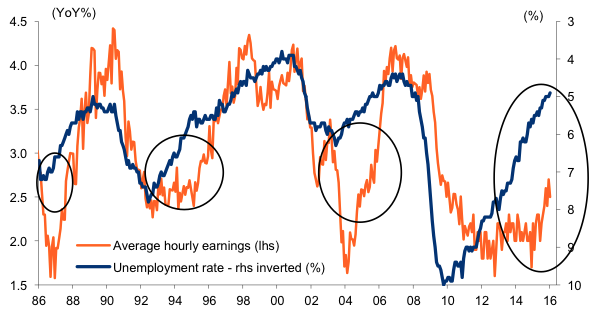 Figure 1 shows how falling unemployment failed to lead to the acceleration in wage growth that is typical before the crisis. In a similar vein, this has led the Fed to hold off from raising rates. 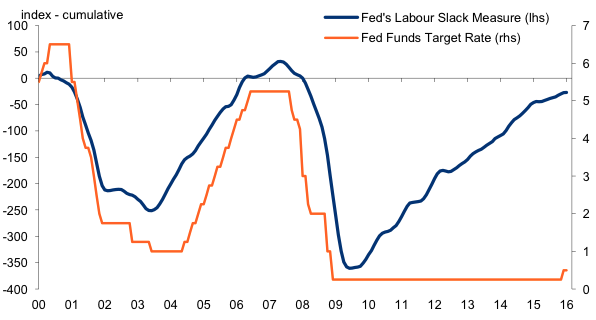 At the current level labour market ‘slack’, as measured by the Fed’s own favoured index, the Fed funds rate ‘ought’ to be at close to 5% by now. Economic weakness and instability are also sources of political tension, both within and between countries. High unemployment and rising inequality have fuelled a backlash against globalisation, free-trade, and big business. At least outside the US, support for progressive taxation and tougher regulation has grown. This may weigh on financial markets and corporate confidence and investment. In this way, there is the danger of a negative feedback loop between economic and political instability. Were the populist backlash to lead to material shifts in the thrust of policy, then it would have lasting, structural effects. For example, backtracking on trade liberalisation could damage the growth in trade and investment. So distribution, institutions, and politics matter. This is something which is largely overlooked by the neoclassical economic models, with their single representative agents, which are still doggedly employed by many economic forecasters. Central banks have successfully boosted asset prices, not least because of the heavy purchasing of bonds in their QE programmes. Indeed, this has invalidated the original New Normal prediction of low investment returns. Since their nadir first quarter of 2009, US equities have returned an annualised 16%, corporate bonds 9%, and even government bonds over 4%. However, this leaves asset markets vulnerable if the economic reality fails to measure up to these higher valuations. Moreover, the regulatory-driven shift of risk away from taxpayers towards markets compounds this risk. The sell-off in bank contingent convertible bonds(CoCos) earlier this year is one example of such fragilities. The essential point is that attempts to increase the resilience of individual banks do not necessarily make the system as a whole more resilient. Such uncertainty lies at the heart of the New Abnormal. The attempt to sweep this collection of structural instabilities and fragilities under the carpet with talk of a New Normal is a damaging distraction to the urgent task of confronting this reality. Cliffe, M (2014) “The New Abnormal - more shocks are in store”, blog entry. El-Erian, M (2009) “A New Normal”, PIMCO. El-Erian, M (2016) “The only game in town: Central banks, instability and avoiding the next collapse”. Keen, S (2011) Debunking Economics. Minsky, H (1982) Can ‘it’ happen again? : Essays on instability and finance. Teulings, C and R Baldwin (Eds) (2014) Secular stagnation: Facts, causes and cures, CEPR Press. Turner, A (2012) Economics after the Crisis: Objectives and means. For an extended discussion of these points, see Cliffe (2014).